We actively encourage Health for Life. 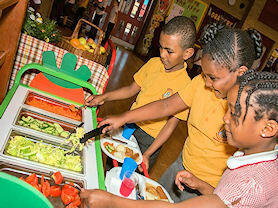 City Serve cooked lunches are carefully balanced and nutritionally checked against the Government Food Standards. The price of a school lunch is currently £2.30 (£11.50 per week). Dinner money must be paid in advance on a Monday. Children have two options to choose from for their main meal. Each morning, the children decide upon which option they would like for lunch. 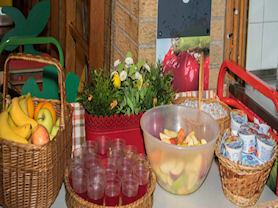 Seasonal vegetables, salad, a selection fruit, homemade bread and water are provided on a daily basis. 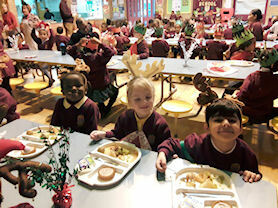 The children who have school meals eat with their class in our school hall. 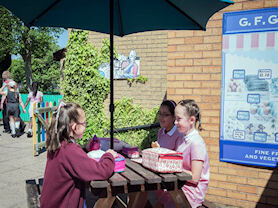 Teaching staff and senior leaders eat with the children on a rotational basis throughout the week. Our menus are rotated on a four week cycle. City Serve provides our school meals. 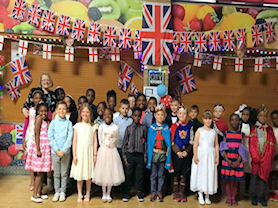 They are Birmingham City Council’s award winning social catering business who exist solely to support the nutritional wellbeing of the region’s students. They insist on buying the freshest of seasonal vegetables and produce, source product lines that meet Food for Life Standard. High-quality ingredients are used. Only buying the freshest of seasonal vegetables and produce. They buy sustainable ingredients from sustainable sources. All suppliers are located as close to the West Midlands as possible. We do this to support the economy, keep the food fresh and reduce the impact of ‘food miles’ on the environment. Many diets can be catered for following consultation with parents / carers, your child’s school and dietician. Regular monitoring visits to the school in addition to advice and support from a Client Manager. Our children love a roast dinner. Children from Year 2 onwards select their own pudding. Time to talk over lunch! Classes vote on their favourite lunch for the menus. Christmas lunch where everybody is having fun! Celebrating Harry and Megan’s wedding. Alternatively, children may bring a packed lunch which is eaten in the school hall or Family Learning Room during the winter and outside during the summer months. Thank you to parents and carers for providing children with a healthy packed lunch for lunchtimes. Please remember children are not allowed to bring in fizzy drinks or numerous sweet snacks. School will provide children with water. Packed lunches must be in a secure container labelled with your child’s name. 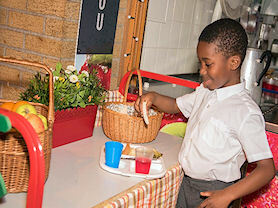 Visit the Change 4 Life website for more ideas about making healthy lunch boxes from the NHS. It has some great ideas for you and your child. Together we can try to ensure our children are fit, healthy and are able to establish and maintain a healthy lifestyle. 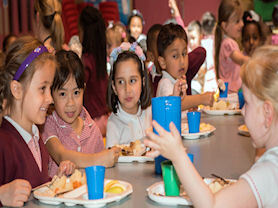 In Reception, Year 1 and Year 2 your child is entitled to a Free School Meal. To bring additional funding into our school budget we would ask that you read the information below to see if your child is eligible for free school meals. An email will be sent to the school confirming that your child is entitled to free school meals. If your child is in Years 3 to 6 please check if he or she is entitled to free school meals as this brings even more funding into the school. 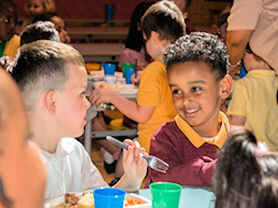 When your child has moved into Year 3 please remember that your child’s school dinner will have to be paid for unless your child is entitled to free school meals. If you require further assistance please talk to a member of the office team. 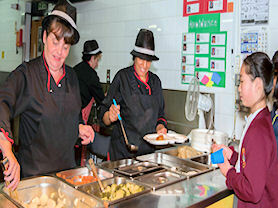 Check if you are eligible, and apply online, at the Free School Meals Checking website. This form takes less than 5 minutes to complete, the school will be sent an email confirmation if your child is eligible.